For an article on their website about the University of Arizona’s new Health and Sciences Innovation Building, façade subcontractor Kovach Building Enclosures interviewed Amy Bossert, Project Manager of Boston Valley Terra Cotta, to discuss the importance of early collaboration and highlight five elements that they felt helped to make this project a success. In 2019, The University of Arizona will be opening the new Health and Sciences Innovation Building (HSIB). The structure was designed by CO Architects and constructed by Kitchell of Phoenix. Boston Valley Terra Cotta worked closely with Kovach Building Enclosures, the façade subcontractor on HSIB, to manufacture the TerraClad® façade. 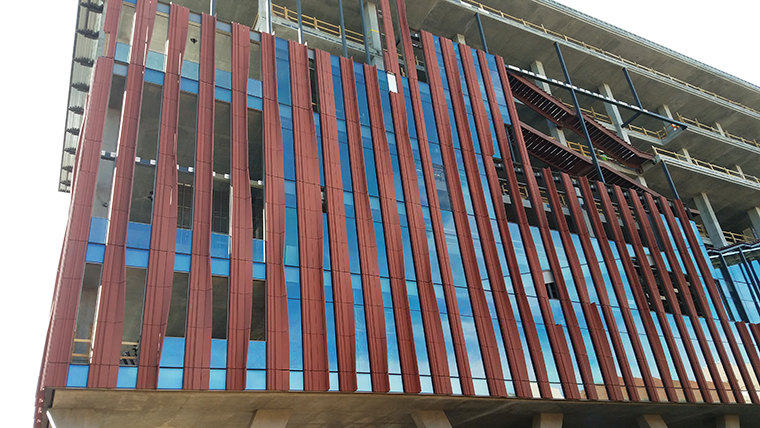 The exterior of the Health and Sciences Innovation Building features 12″x 60″ extruded twisted terra cotta louvers, with a red through-body color. A full-scale mockup of the TerraClad® façade system at the Health and Sciences Innovation Building, featuring custom terra cotta louvers developed by Boston Valley Terra Cotta. The collaboration of Kovach and Boston Valley benefitted greatly from early involvement in the project. 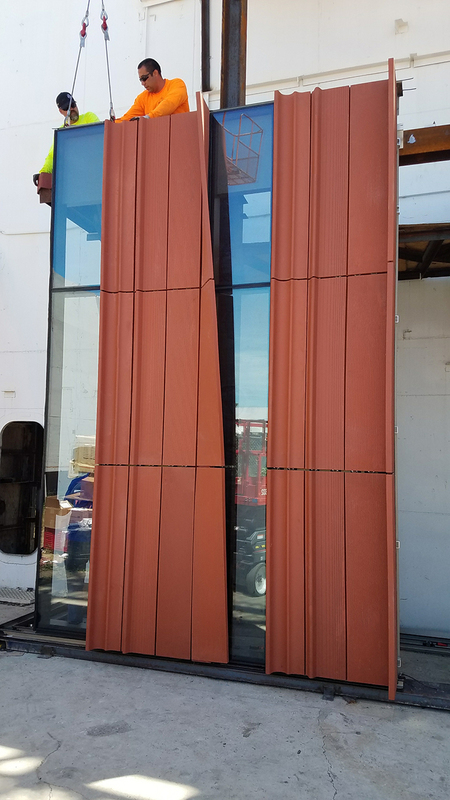 The two companies were able to identify and address the unique challenges required from this custom terra cotta façade. 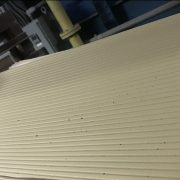 The panels of terra cotta on the HSIB exist in permanent action, with a 90-degree rotation carried from bottom to top; special manufacturing techniques were used in this process to create the elegant twist in the louvers. Boston Valley was able to help Kovach understand the capabilities of architectural terra cotta and ensure that the project was delivered on time and within budget. Due to the intricate manufacturing process and high degree of customization, it is essential that terra cotta suppliers and installers are brought on board very early in the design process. “Take time to learn about the material. You need to know when you are over pushing the boundaries, and get a realistic expectation to avoid problems later in production,” noted Amy Bossert, Project Manager for Boston Valley. Terra cotta is a natural product that does not produce the same regularity as manufactured material. During the fabrication process, variation in color, grain, and texture can be guided but not fully controlled. However, that variation creates an organic, timeless attraction that should be embraced rather than subdued. 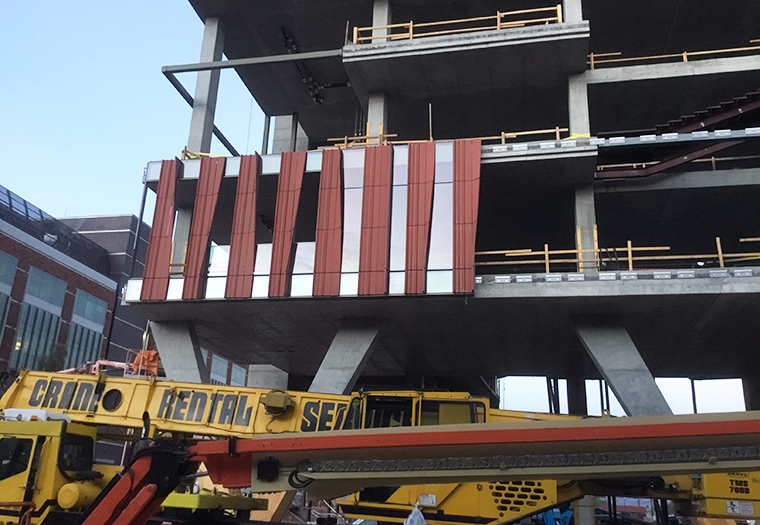 Although Boston Valley’s standard attachment system is frequently used on different projects, when designing a unique terra cotta façade, it is likely that a customized attachment system will need to be designed. The size and rotation of the twisted terra cotta fins on HSIB added complexity to the project. “Despite concerns to the contrary, tailor-made solutions do not have to adversely affect the client’s budget,” added Bossert. With an elevated level of design, customization, and longevity, terra cotta should be viewed as a premium product that is well suited for signature buildings with high profile and aesthetic appeal. Again, getting a team together early will significantly help you identify ways to put terra cotta on your project and manage costs. The beginning of the installation phase of the terra cotta façade at HSIB. Read the full article on the Kovach Building Enclosures website. Click here to read a previous Boston Valley blog post on the University of Arizona’s Health and Sciences Innovation Building.